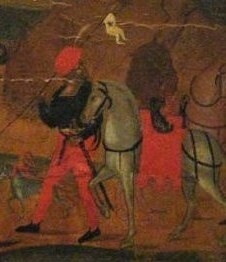 wearing the red fabric that appears so often in Venetian documents on stratioti pay. Stratioti come in several categories. One is those for whom there was a short-term contract: they appeared, served their time, and left. Another category is for those who had land allotments and were considered residents of the territory. A third category is the provisionati, usually the kapetanioi, who received larger amounts of money, payments of red and black cloth, and sometimes large land allotments, maybe with fortifications. They were guaranteed payment for a certain number of stratioti, and their servants were usually provided with extra gifts. This is a very interesting system because, while ostensibly imported from Italy, it actually represents the monetization of the pronoia system. It is claimed that there is no evidence for the pronoia system in the Morea but we have former landholders becoming provisionati, and I have now found documents that specify land grants by the despots for men we later see as kapetanioi. It takes a lot of reading back and forth. Taking into consideration the vicissitudes of weather and the lack of loot in peacetime, Venice provided a certain number paghe, payments, in cash and grain in a year. That is, they provided them on paper, and some years it was 3 and some years it was 6, and sometimes it was four of cash and three of grain. Minio's letters say otherwise: "In 19 months they have had only two pays of cash and two of grain." "For a year they have had no payments of cash or grain." "You promised the stratioti 3 pays of grain a year, and the soldiers 5 of cash." This is where it gets dicey. Stratioti had to appear at the regularly-scheduled mostra with arms and horses in order to get those payments, if the payments had actually arrived. No governor could have been sanguine in the face of 500 armed stratioti when telling them they would, again, not be paid, and during the war a commander was decapitated when he gave that news once too often. If payments had actually arrived, a stratiote without a horse or weapons would not be paid. But if the period of hunger had been going on long enough -- and most of the stratioti had families to feed -- they might have to sell the horse, or the weapons for the metal in them, to get food. During the war Barbarigo reported men selling off their bollete (promises of pay) for a quarter of the value in order to buy food now. Minio reported his Cretan ballestrieri, bowmen, selling their bollette for half the value. There was never a budget item "food for soldiers." Fanti were paid on one schedule, stratioti on another, and the ballestrieri were to be paid from the administration Candia which rarely happened. When Minio was captain in Candia twenty years later, the payments to the Nauplion ballestrieri were absolutely conscientiously made on schedule. So through Minio's letters you see one group or another hungry. More than once in Nauplion, Minio took loans from the better-off corporali (fanti commanders) so he could buy food for the ballestrieri and stratioti. One of the things you see in the Minio letters is that you can predict when the peacetime food is simply going to be inadequate. In the winters of 1479-80 and 1480-81, Minio reports that the rains and the early grain look good for the year, and they are. In the winter of 1481-82, he predicts a poor crop, and that summer the stratioti, and Nauplion, are on the edge of famine. Each year, from March on until early June, Minio is desperate for grain to feed the stratioti. It is no coincidence that the Lenten fast coincides with the depletion of food stores and before the new growth. There was a problem in the summer of 1480. Fearing an Ottoman attack -- and there were massive assaults on Rhodes and Otranto -- Minio called up everyone from the farms, Greek landworkers and stratioti, and provided them with spears from the Nauplion armory. Shipping for food and cash from Venice was blocked. While there was a fine harvest, within another month the Italian fanti were hungry, and because of their weakened physical condition, many of them were dying from the summer malaria. Fanti did not have land (although Antonio Marinato and his troop may have been pirates on the side, and interestingly, none of them died) and were dependent on what was provided from Venice. Minio had been asking for money for grain for 6 months, and finally was sent old grain from Venice, half of what he could have bought locally for the same price. Would you believe that Venice had financial interests whose pacification was regarded as more important than hungry soldiers? Now, when the pay actually arrived, there were still roadblocks. A stratiote received 28 soldi or 112 torneselli in a payment. Of this, he had to pay 4 soldi to the Paymaster-General, and 2 to the paymaster at Nauplion. A fante, an Italian soldier, should his pay have arrived, would receive 300 torneselli, and he was not likely to have a legal family. So right there you can see a problem and why stratioti needed land, and loot -- and why many of the unpaid stratioti who joined the Kladas revolt took the opportunity to continue as professional looters. One way around on occasion this was for stratioti companies to be written up with allowance for a certain number of paghe morte, dead pays, and at mostre, the number of live pays were reported. 1 kg. wheat = 1.52 liters, as bread, has 2500 calories. Cooked as porridge, it produces about 6 servings. In other words, 1 kg. of wheat is basic nutrition for a man for 2 days, though without other sources of food, malnutrition will soon set in. Cloth was always nice, though not edible. During the 1484-1478 war, Yanni Volassi and Piero Boziki were given robes, and one of Micheli Rallis' aides was given a scarlet robe. Giorgio Pagomeno and Giorio Paniperi were given, respectively, robes of black velvet and cloth-of-gold. (This was probably an indication of knighthood: Kladas and two men with him whowere knighted by the Doge were given cloth-of-gold robes.) Early in the war, provveditor Andrea Dandolo was sent 63 lengths of cloth to distribute to the kapetanioi according to status and loyalty. Nicolo Gritzas, Petro Bua, Nicolo and Micheli Rallis, and Count Comnino were given fine scarlet. Like service ribbons of the last century, cuts and colors were calibrated to honor and status. But what comes clear, over and over, reading between the lines in the Venetian documents, is that after mid-century Venice was always too stressed to be able to organize the necessary funds for the necessary shipments at the right time: this assumes the will, good shipping weather, and seas safe from piracy -- none of which could be taken for granted.